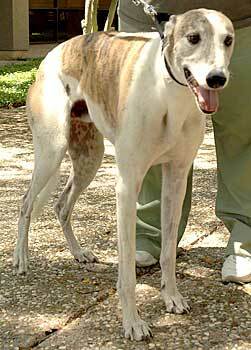 Speed, aka Slatex Candyman, is a 7-year-old white male with brindle patches, born in October of 1998. 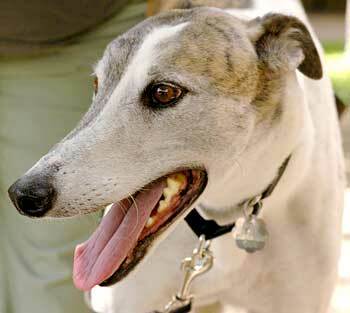 Speed came to GALT from Hillcrest Animal Rescue, where he arrived after his family divorced. He is a gentle, easy-going kinda guy who more than deserves his forever home. It is not known at this time if Speed is small animal or cat tolerant. Speed is a 7-year-old beautiful boy (born 10-98) who was adopted by a couple who later released him due to divorce. He holds no grudges, and is loving and affectionate with everyone he meets, especially children. He rides well in the car and is perfect on a leash. He will do a full body swoon if you scratch his ears and practically goes cross eyed if you find one of his many tickle spots. He has been the perfect gentleman in the house: no accidents, no marking, no interest in the trash or kitchen counter tops. Speed gets along well with the other dogs. Speed is a very handsome boy who needs a leg to lean on and hands to pet him all the rest of his life. He has that perfect greyhound experession - calm, regal and full of love. How can you resist that face? 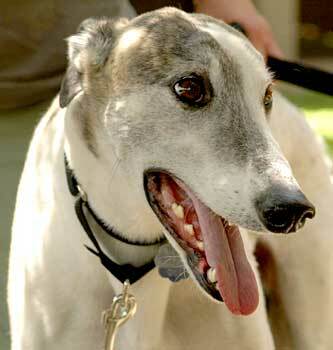 He will make a lucky family an excellent pet, and will be a shining example of what is best about greyhounds. Everyone who sees him thinks he's an amazing boy. Come see what you think!